With the highest regard, this is a sponsored post with Melissa and Doug. All opinions are my own and I am thrilled to collaborate with their team on a conversation around The Power of Play. You can read all about Melissa and Doug’s mission here. Melissa and Doug feel, “it is our obligation to change the world’s way of thinking about childhood and play” and I couldn’t agree more! I'm also beyond excited to share that last November I was a guest of Melissa & Doug this week at the FAO Schwarz opening in NYC at 30 Rock! As part of that, I explored their showroom, but, most importantly, I be sat down with Melissa and Parents magazine to talk about the importance of play -- specifically how we encourage and facilitate play that ignites our kids' imaginations in our very busy, screen-dominated lives. Pinch me! I must have been dreaming. RELATED: Read the post visit follow up post on how to minimize screen time here. Play takes practice, not perfection. Does your child last 2 minutes of play on their own? Congratulations, you are well on your way to 20 followed by 60. Because remember, play takes practice, not perfection. As adults, we may aim for a beginning and ending point. A firm start to finish. But that is not necessarily how early learners work. Little learners need time to touch. Manipulate. Transport. Transform. Stack. Create. And these are just the start of the most important foundations to learning. I have an almost five year old, a three and a half year old, and 17 months. I have watched their play progress over time and every day their play momentum grows. The power of play takes practice. What are your struggles with getting your children to play more? 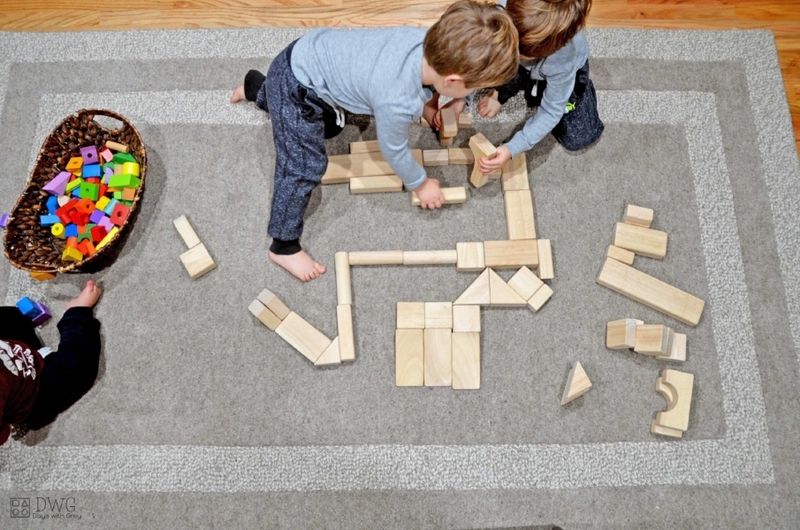 When children don’t play on their own for extended lengths of time, we may tend to give up. It can be loud, messy, and chaotic. In fact, I am intentionally writing this post as my three boys play around me. I am watching their interactions and remembering how we got to this point of play in this screen filled generation. I also stand here watching independent play transition constantly. I see little attentions take many turns. My three-year-old begins by transporting small pumpkin erasers in a fire engine to the circus and is now off to placing large real pumpkins onto the back of his tricycle. Again, play may seem as if the house got turned upside down. And it probably did. But play is so much more than that. From the mouth of Mr. Fred Rogers, “Play is often talked about as if it were a relief from serious learning. But for children play is serious learning. Play is really the work of childhood”. Every activity you set up for your child, or manipulative to hold, touch, and transform acts as a building block to play. Think of child play like a giant building. You cannot get to the 11th floor without first stepping into the lobby. YOU, are helping build that lobby. You are doing this with simple set ups such as Breakfast Invitations. You are doing this with allowing your children to play with open ended toys. You are doing this by being patient. Occasionally stepping in and playing alongside your child without worry that you are creating a crutch to independent play. Sometimes children need a small jumpstart on where to begin. Remember, play takes practice. Not perfection. So let’s see how we can incorporate the power of play into our every day. Again, I was thrilled to be able to meet with Melissa and Parents Magazine this week in NYC to dive even deeper about the power of play. After listening to a select group of influencers and a child development experts, I returned with even more strategies for you (and I) to begin implementing in our homes and you can read them here! New activities in your inbox every Monday and Wednesday at 7am.